2019 bursts with activity and change as the first New Moon is also a Solar Eclipse in Capricorn on Saturday, January 5th. The Lunar Eclipse follows in two weeks, in the sign Leo. Eclipses are known for quickness, the wow factor, "didn't see that coming" at least not now, and people coming and going from our daily lives. The Moon is waning toward the first eclipse and New Moon. Sunday: The Libra Moon opposes Uranus for a surprising or tumultuous effect. A rocky relationship or unexpected bit of news may require a calm, collected response or perhaps surrender into doing nothing as 'whatever it is' takes shape. Libra Moon void from 5:53 to 8:23 pm ET. Scorpio Moon for the rest of the day/night. Scorpio Moon may create strong waves of any type of emotion. Be a little bit protective of your self, your privacy and your feelings as needed. Today's color is Indigo. Monday: Scorpio Moon ranges from sentimental to romantic or passionate for New Years' Eve and the last day of 2018. Honor your feelings, and in particular if you feel like being alone or quiet, don't push yourself to be festive or social. We'll experience this a bit differently depending how the signs Capricorn and Scorpio resonate in our charts. Sun and Saturn in Capricorn are in harmony with the Moon. Some will make serious life decisions today, and the aspects help those decisions stick. Mars moves into Aries, home sign for the warrior and activating planet. Today's color is Black. Tuesday: Scorpio Moon aligns with Pluto and meets Venus, putting relationships in the forefront today. It's natural to review or reflect on relationships, current status, willingness to be open to relationship or fears around intimacy. This can be an intimate and romantic time. Void of course Moon from 5:26 pm to 3:58 am ET. Today's color is Maroon. Wednesday: Sagittarius Moon time begins and the Moon is waning toward New. We have an eclipse on Saturday and by tonight some of the news or effects could take place. The Sun meets Saturn in a very down to earth, committed, intentional conjunction. You could be asked for a definite answer. Also, it's an aspect for honoring our elders and seeking wise counsel. Today's color is Purple. Thursday: Sag Moon meets Jupiter for broadening and inspiring. Release limiting beliefs or situations in favor of what frees your mind or opens your options. The Moon square to Neptune in mutable signs challenges us to use imagination and believe in magic without losing our sense of reality. Avoid escapism, but have faith in things you cannot see or prove, as that seems appropriate to you. Today's color is Light Blue. Friday: Short void of course Moon (which is like a transition time, something like waiting in a line for us humans) from 12:41 to 1:55 pm in Sagittarius, then the Moon will be in Capricorn, sign of our solar eclipse tomorrow. This is a very transitional sort of day. It might be worthwhile to pause and proceed slowly for the moment as much could change drastically or in an unusual way now or within the month. Mercury's final move in Sagittarius is a trine to Uranus, the wild card planet. News may take you off guard or someone may show up or get in touch quite unexpectedly, potentially changing your focus or experience. Uranus is retrograde so the resonance of the past is part of the deal. Has this situation shocked or taken you off guard before? Do you want to respond differently now or welcome the chaos or other turn of events? Mercury moves into Capricorn for a few weeks, at 10:40 pm ET. It's a get your act together sort of feeling while Mercury, Saturn, the Sun and Pluto all gather in this no nonsense, get the job done type sign. Today's color is Yellow. Saturday: Solar Eclipse always comes with a New Moon. This occurs at 8:28 pm ET. Today's Capricorn Moon and Sun meet, in touch with Saturn, not far from Pluto, and aligned with Neptune. Even if this is a big reality check, there are some favorable vibrations for committing, facing fears, regaining sanity, and taking action that's much needed. Today's color is White. THE MORE GRATEFUL I AM FOR THE WEALTH AND ABUNDANCE IN MY LIFE, THE MORE REASONS I FIND TO BE GRATEFUL. I EXPRESS GRATITUDE FOR ALL THE GOOD IN MY LIFE. EACH DAY BRINGS WONDERFUL NEW SURPRISES. I PAY MY BILLS WITH LOVE, AND I REJOICE AS I WRITE OUT EACH CHECK. ABUNDANCE FLOWS FREELY THROUGH ME. AT THIS VERY MOMENT, ENORMOUS WEALTH AND POWER ARE AVAILABLE TO ME. I CHOOSE TO FEEL WORTHY AND DESERVING. Capricorn is a sign of prosperity, abundance, property and the element of earth. Happy New Moon in Capricorn, my friends! Trust in your ability to manifest. Welcome to the last full week forecast of 2018! Robin's Zodiac Zone will turn 20 this year! This week I made two meditations free for you to download, my holiday gift to you, at robinivypayton.bandcamp.com. One is a yoga nidra and the other a simple meditation. There is also a 3 track album there for $8.00 if you want more. Please enjoy the freebies ,and maybe begin a new routine of meditation the easy way. Happy Solstice and Full Moon! Sunday: Cancer Moon with two oppositions (which add emphasis and can be conflicting) and two trines which are harmonious or bring ease. The serious discussions and news are mixed with romantic and forgiving vibes. Consider the Moon still Full. Today's color is Light Blue. Monday: Cancer to Leo Moon at 11:59 am ET. Moon void before then for an hour and ten minutes. Leo Moon is joyful, festive and grounded. Hold steady and optimistic as Uranus aspects the Moon and can bring unexpected surprises or changes. Mercury square Neptune in Sag/Pisces, the mutable signs on Christmas Eve. Practice forgiveness. Today's color is Orange. Tuesday: Leo Moon aligns with Jupiter and Mercury in Sagittarius for a very hopeful, inspired and in some cases exciting Christmas. Leo is the sign of children and our childlike nature. Today's color is Gold. Wednesday: Leo to Virgo Moon 12:50 pm ET. Void of course Moon is 10:37 am to 12:50 ET. These shorter void Moons can help things run more smoothly and clearly. The Moon trine to Uranus and the Sun rises inner fire and motivation. Being active or productive makes sense. Reorganize and clean. Today's color is Brown. Thursday: Virgo Moon engaged with 6 different planets, 6 different types of connection. Expect variety. Wear Navy Blue. Friday: Virgo to Libra Moon 3:23 pm ET, and void of course from 11:27 am until then. A good day to relax, not plan too much, and find some spontaneity. Venus aligns with Pluto for finding some inner peace (which is helpful since Mars is opposing the Virgo Moon earlier). Let conflict be resolved. Today's color is Lavender. Saturday: Fourth quarter Moon waning in Libra. Perhaps you can take an impartial point of view or step back from a conflict or misunderstanding in favor of peace. Moon aligns with Jupiter for adventures with best friends and lovers. Find a buddy and enjoy lightheartedness. Today's color is Pink. Gratuity is appreciated, anytime you're feeling it. Sunday: Aries Moon. Venus and the Moon are in contact with Saturn, planet of discipline and responsibility. Venus and the Moon relate to emotions and relationships. Some will settle personal business and finalize decisions regarding relationship, partnership and the way things will be going forward. Today's color is Orange. Monday: Aries Moon, and Aries ruling planet Mars acts with Pluto. Facing fears and acting courageously and from a place of great wisdom is favored. Themes of rebirth and a continuation of Sunday's forecast are relevant. Moon and Sun in harmony provide some fire energy and optimism or sense of adventure even if there's a melancholy undertone. Today's color is Maroon. Tuesday: Void Moon time 2:21 to 4:37 am ET, then the Moon is in earth sign Taurus. Hands on work, the to do list, shopping and other financial dealings and acquisitions are helped along by Saturn in Capricorn. It's a day to get real and move on things, considering the long term. Today's color is Green. Wednesday: Taurus Moon, void from ET 7:42 pm on, and the Full Moon warms up for Saturday. Taurus Moon opposes Venus for the partnership terms that need to be established and adhered to. There could be a loving, romantic quality to this or it could be that very serious agreements need to be made. Moon aligns with Neptune, Pluto and Mars also. Whatever you're doing today, there's depth and long lasting effects. In the evening, chill and find the comfort zone. Wear Pink. Thursday: The Moon moves to Gemini for what may feel like a quick interlude and burst of social energy and business transactions before Full Moon and Christmas holiday. Gemini Moon 9:34 am ET partway into Saturday. Full Moon in Cancer is on Saturday at 12:49 pm ET. People may be rushed, busy, and scattered in focus or priorities. For that reason, try and slow down to avoid anything unintended or due to not paying attention, especially on your commutes for the rest of the week. Family pulls are strong. Gemini is the sign of your sibling relationships. The Sagittarius Sun and Uranus retrograde in Aries are the fire fed by Gemini Moon's air element and this can be dynamic, combustible, and wildly surprising. Today's color is Yellow. Friday: Gemini Moon. Today is the Solstice as the Sun moves to Capricorn at 5:23 pm ET. We have the fewest hours and minutes of daylight. Many aspects today include Venus and Neptune aligned for romance and love. There's also indication of important developments, perhaps globally with Jupiter involved. Jupiter meets Mercury and opposes this almost Full Moon, and major discussions, agreements, plans for growth and big Sagittarius type action is spotlighted. Today's color is Blue. Saturday: The Moon is Full in Cancer, sign of home and family, at 12:49 pm ET. Family news is likely. Mars and Uranus, both action oriented and quick acting planets, are in line with the Moon. Take good care of each other today. Not only with emotions be running high, but other external (maybe US or world) developments may be happening fast and in the forefront as we approach Christmas and new years. We are in eclipse season now, with the next New and Full Moons of January being solar and lunar eclipses, heralding major changes. Foreshadows and precursors and the topics or themes of interest arise now. Today's color is White. Friday evening, December 21st 6-7 pm, our monthly Yoga Nidra at Greener Postures Yoga studio in South Portland. It's a usual drop in rte and you don't need to sign up in advance, just come. Wear comfy clothing. This is a practice of REST. How nice that it falls on the longest night of the year, and one day away from Full Moon. This could be the ideal time to try Yoga Nidra for the first time, in a safe welcoming space. 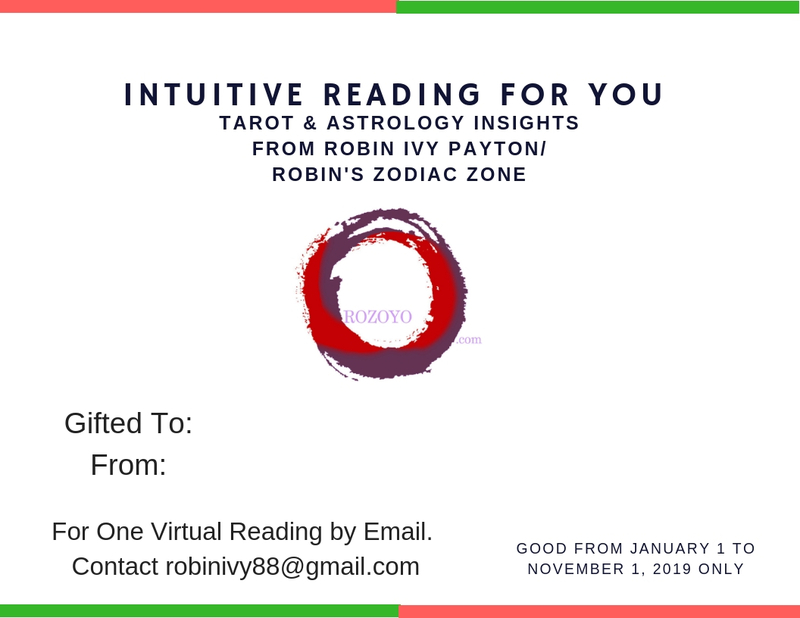 Gift Certificates for emailed readings in 2019, at a special price now through December 21st $75 (regularly $88). 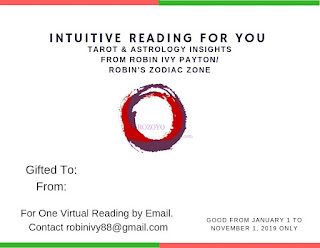 Mini readings $35. Each certificate will be emailed for you to print and will have a special number assigned it. Readings offered from January 1 to November 1st, 2019. Give the gift of Insight. Paypal or email me if you prefer to send a check in the mail. My one special event type class is Friday evening, December 21st 6-7 pm, our monthly Yoga Nidra at Greener Postures Yoga studio in South Portland. It's a usual drop in rte and you don't need to sign up in advance, just come. Wear comfy clothing. This is a practice of REST. How nice that it falls on the longest night of the year, and one day away from Full Moon. This could be the ideal time to try Yoga Nidra for the first time, in a safe welcoming space. Sunday: Capricorn Moon meets both Saturn and Pluto and harmonizes with Neptune and Mars both in Pisces. This looks like a balanced day with a mix of effort and ease, personal and business or homework type tasks. Today's color is Black. Monday: Capricorn Moon aligns with Mercury. You may get the feeling of being back on track, organized or productive. Make or reschedule appointments or travel. Void Moon 4:27 pm to 6:39 pm ET then in Aquarius sign of forward thinking and also friendly get togethers. Today's color is Turquoise. Tuesday: Aquarius Moon and we're in the New to Full cycle. Try to make good on a relationship rift. Moon aligns with Jupiter for an expansive point of view and approach. Today's color is Pink. Wednesday: Mercury is back in Sagittarius as of 6:43 pm ET. Notice what you're back at resolving or trying to decide upon yet again. Moon and Sun are in harmony which is good for communication, expressiveness and adventures. Wear Silver. Thursday: Void Moon time is like being in a line or waiting room. Hang in there 5:20-7:40 am ET. If it's the commute time it might be a little bit more than you hoped for in terms of time or behavior of other drivers. People may be slow or hurrying, rather than grounded and just right. The Pisces Moon has a mix of aspects today. Practice what keeps you sane amidst whatever else is happening. Wear Green. Friday: Pisces Moon meets Mars and Neptune while in harmony with Saturn. This uncommon and contrasting mix is like getting friends together that may have nothing in common. Yet sometimes it works, right?! Find the blessing and beauty in the differences today. Wear Black. Saturday: Pisces Moon void 6:49 am to 7:44 pm ET. See if you can find the flow where there's not resistance. Avoid pushing yourself or having strong requirements of others. It's just not like that. Space and flexible timing are likely to have the best results. Aries Moon leads to party time or a burst of motivation tonight from 7:44 pm. Get togethers also go well during the day, generally being more mellow then firing up later. Today's color is Red.